Should more funding be made available for research and treatment of mental health issues? MUCH more funding should be available for the treatment of mental health, not research. We know what the problems are, and what helps IF it is available, how many health service cuts there’ve been and how harsh austerity policies push more people to the edge. Caseloads are so high and staffing levels so low that people who have attempted suicide are falling through the gaps, as the report by CQC on Kent and Medway NHS Trust said last year. Kent police have had an 18% cut in funding, but have to step in for public safety reasons when those who need to be admitted for care are turned away, and nationally it’s the same. Our young people are driven to the edge. A recent BMJ article mentions a 68% increase in hospital self- harm presentations in 13-16 year olds between 2011 and 2014. CAMHS (Child and Adolescent Mental Health Services) are under-resourced. NHS England admits that only one in four under-18s with a diagnosable mental health problem receives treatment. If a Dover youngster does get a bed it is miles away at Ticehurst. This, in the sixth richest country in the world? Ah, but we’ve the greatest level of inequality in Europe. Our NHS money must not slip into the shareholder pockets of Circle/Virgin Healthcare through NHS privatisation. The dominant model of psychiatry is driven by pharmaceutical companies. Acute conditions are treated by hospitalisation, top-down diagnoses by psychiatrists, then some pretty heavy-duty medications. Chronic conditions, treated in the community, are also heavily dependent on drug therapy, because cheaper than other, more effective therapies. 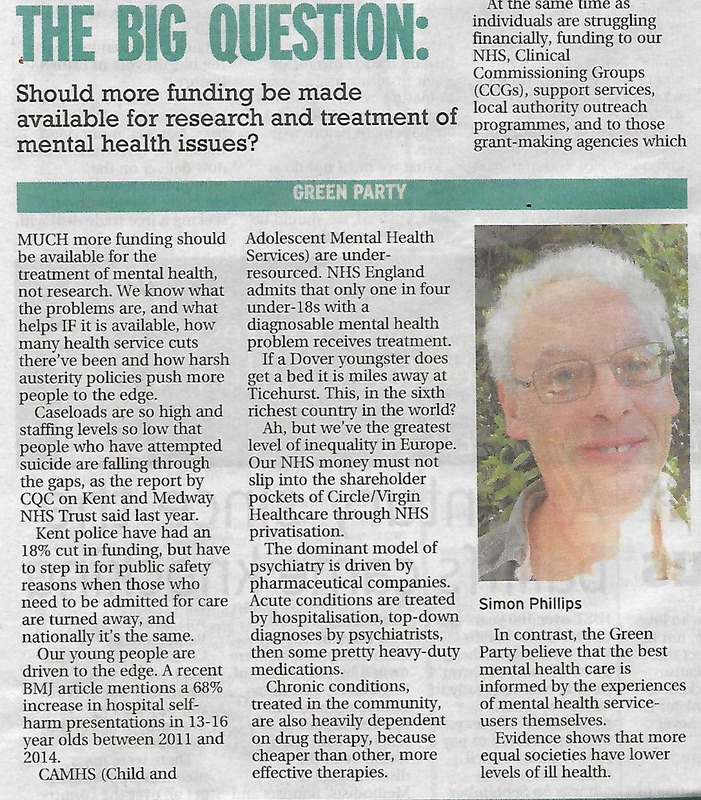 In contrast, the Green Party believe that the best mental health care is informed by the experiences of mental health service-users themselves. Evidence shows that more equal societies have lower levels of ill health. This entry was posted in Mental health issues, News on November 2, 2018 by Sarah.